Nemon Yu has been teaching Chinese as a foreign language for over seven years since she graduated from university. She has been with us at Touch Chinese as an online Mandarin tutor for 4 years. Her students always speak highly of her professionalism while teaching as well as of her pleasing attitude. 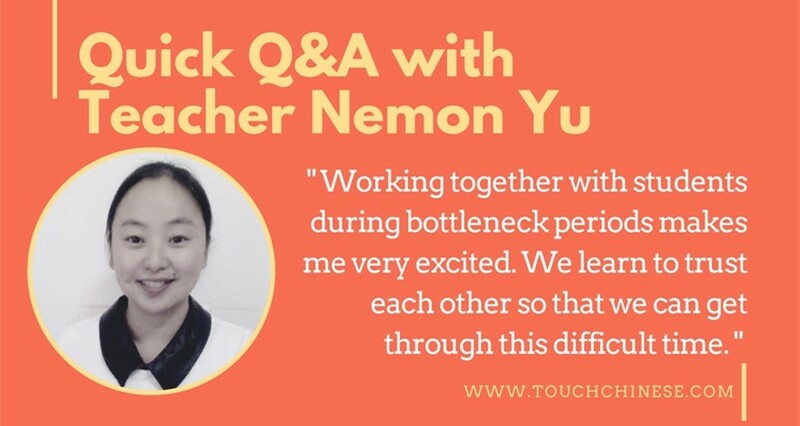 This time, we invite Nemon Yu to have a quick Q&A interview to help you know her better. 1. How does your professional background affect your teaching? I majored in International Politics and Linguistics, which helps me a lot with my work. It made me understand not just matters of inter-cultural communication, but also about how to teach a language. Because of this, I can have better communication with my students with regards to both culture and language. 2. What is your favorite part about teaching Chinese? Helping students improve their Chinese pronunciation, enlarging their vocabularies, grasping each grammar point, and being able to hold different topics of conversation all make me very happy. Working together with students during bottleneck periods makes me very excited. We learn to trust each other so that we can get through this difficult time. This working process is very precious for both me and my students. 3. Is there any student who impressed you a lot in your current work? We provide a personal study plan for each student, and all my students impress me a lot in different ways. Brad is a good example. He learned Chinese with an app for more than six months before taking class with me. He mentioned that he always followed the voice message from that app, even if he did not understand the exact meanings of words and sentences. My first class with him made me very confused as he could only say some words correctly and could never say a complete sentence. His pronunciation was also a big problem as nobody was helping him to correct it, especially his tones. So, after the first class, we made a study plan that followed a textbook where he could systematically build his vocabulary, grammar knowledge, and conversation skills. We combined our new lessons with what he learned with the app. He has shown great improvement so far. 4. Besides learning with a professional teacher, do you have any recommendations for students to do self-learning? It depends on the students’ level. If he/she is just a beginner, I recommend for them to focus on the study plan their teachers made for them because the teacher`s experience can help them develop a good foundation in the most efficient way. For intermediate or advanced level students, I recommend that they can also use some apps, like Sina news app or QingTing FM, as additional learning tools to improve their Chinese. Real-life learning materials can help the students be more familiar with the language. I like playing basketball and playing the guitar.